Never in recent memory has there been less focus on the operating system, a subject we examine periodically (coverage, coverage, coverage). With the exception of mobile, where the adoption of Android versus iOS is a subject of intense interest, operating system inquiries have never been fewer. We see this qualitiatively, as the nature of our engagement shifts to the layers above, below and around the operating system; from the virtualization substrate to the middleware equivalent abstractions for application deployment to the management tools that both provision the above and keep it running. We also perceive the shift quantitatively. In October of 2009, “opensolaris vs linux” was the #1 incoming query to RedMonk properties according to RedMonk Analytics; “linux vs opensolaris” was #7. In October of this year, “opensolaris vs linux” is #13; “linux vs opensolaris” is not in the Top 100. The simplest explanation for this might be the decline and acquisition of Sun, and the subsequent deemphasis by new owner Oracle to the Solaris brand generally and OpenSolaris specifically. But for this to be true, we should have expected to see commensurate gains to other operating system related terminology, be that Windows, Linux or combinations of both. We see no evidence of this. Our data shows instead a profound shift in inquiries to layers of abstraction above the operating system; Node.js, for example, is massively trending over the past six months, occupying three of the top four spots. As are terms such as “PaaS,” “cloud fabric,” and “saas cloud.” We can even observe in real time the difficulties developers are having in digesting the implications of the new development paradigms and related terminology via queries like “cloud & saas & difference” (#23 last six months). The obvious conclusion is that the operating system market is in transition. The deemphasis of the operating system is even apparent from a resourcing perspective. The team originally responsible for DTrace, a still differentiated piece of observability technology built into Solaris, have all left Oracle. Rather than attempting to build another operating system or helping to build a competitors, many have joined Joyent. They may continue to do operating system work there via the illumos project, but their business will be the cloud, not distributable operating systems. There are a variety of reasons for the decline in visbility for the OS; most are likely familiar to you. The ascendance of cloud, the delivery of applications in a network context, open source led shifts in availability and procurement, the accelerating fragmentation of application development, historical trends towards further abstraction, platform consolidation. All are contributing to a shift in the way that applications are designed and deployed, which in turn impacts the role of the operating system [coverage]. The question of whether operating systems still matter is probably a wrong one: the new platforms, cloud included, cannot function without the core functionality an operating system provides. The better question is who operating systems matter to, and what this means for the industry. It is self-evident that operating systems matter – intensely – in the mobile space. Clever solutions like PhoneGap aside, developing for Android is not like developing for iOS. Which in turn is not like developing for the BlackBerry Tablet OS. The mobile landscape is akin to server side development circa 1995, where applications are written directly to the operating system with portability an expensive afterthought. It’s also true that operating system adoption on the desktop remains highly stratified; with the long predicted Year of the Linux Desktop yet to arrive, consumers PCs are still primarily either Mac or Windows. The enterprise server world is a more mature market than either mobile at least, and has therefore already weathered the rounds of consolidation yet to arrive in the world of handsets and tablets. There are fewer legitimate contending platforms in the server market, even as at least one of those (Linux) shows signs of pending fragmentation. Even these fewer choices, however, are increasingly abstracted from application developers. What is the operating system behind Microsoft Azure, Engine Yard, Force.com, Google App Engine, or Heroku? The answer is, in varying degrees, none of your business. These and other PaaS vendors are aggressively distintermediating the operating system by removing it as a choice. Nor is Infrastructure-as-a-Service, which generally still implies a choice of operating system, reflective of traditional enterprise operating system adoption patterns. What the available cloud metrics suggest is an environment where traditional drivers for operating system adoption – commercial support, certified application compatibility, etc – are second to convenience. According to the Cloud Market, which provides relative volume metrics on the Amazon AMI catalog, this was the approximate composition of major operating systems on November 9th. It’s true that this is a survey of available images rather than deployed images. But it’s equally true that this distribution would have been unimaginable even twelve to eighteen months ago: the leading commercial distributions make up only 18.5% of the catalog. Given that we’re still seeing a distribution in the catalog, it’s clear that the operating system matters to cloud deployments. People value choice enough to have created better than 7200 different options. Precisely what matters about those operating systems, however, appears to be in transition. Within the datacenter, on the other hand, little has changed. Which is fortunate for suppliers, because the majority of revenue is still derived from infrastructure maintained and run by businesses themselves. Enterprise purchases still overwhelmingly favor traditional operating system suppliers: Microsoft (Windows), Red Hat and to a lesser extent Novell (Linux), with the majority of the remaining share divided between Unix vendors (HP, IBM, Oracle, etc). The dramatic spike in interest in Red Hat Enterprise Linux 6 speaks to the continuing appetite for new operating system features in a variety of markets. As long as the enterprise markets remain the dominant revenue source, then, operating system vendors have little to fear. The challenge – still theoretical – will be when the shift in developer interest we are beginning to observe begins to manifest itself within an enterprise context. At present, definitive statements that the importance of the operating system will be as diminished as the commodity hardware platforms they most frequently run on today are purely aspirational. On the other hand, who would have predicted fifteen or even ten years ago that one of the major players in the market, a $750M business, would be an entity that sells software that’s available for free? The data we have argues that change is coming. That it is, in fact, already here; it’s just unevenly distributed. It will be interesting to see how the various operating system suppliers leverage, fight or succumb to it. Just as fascinating will be whether the incumbents are able to pivot neatly from one dominant role to another, or whether that process will advantage the contenders. History is no guide here, as we’ve seen both scenarios play out repeatedly. 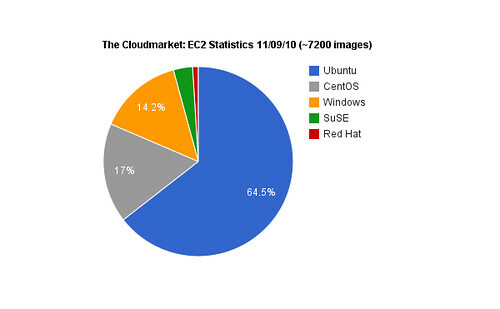 Disclosure: Canonical (Ubuntu), Microsoft, PhoneGap and Red Hat are RedMonk clients. Novell and Oracle are not. The problem is th OS are all the same its still Unix /posix or win32 . However with clouds this is slowly changing to modern APis like VM Api (.NET / LLVM / Byte code) which mean the underlying APIs and hence OS will matter less. New high level Apis will allow new non posix OS the flexibility to provide huge increases in reliability performance and most important security. QNX has made large gains here mainly by breaking a lot of APIs , QNX async apps will not run on other OS. OpenSolaris vs Linux? I think that’s a bad metric if you’re interested in the relevance of operating systems, because it depends on an OS that’s not relevant any more. The only reason to run Solaris these days is to run legacy services that haven’t been ported to RHEL and/or SLES. There’s more NEW commercial software for Linux servers than for Solaris servers these days. Oracle bought themselves a prime lame duck, I’m afraid. Dose the operating system matter! You can read my reply by loading a new program to display it. To run this program you will need to load it using a Sinclare ZX Spectrum. PS. Ubuntu 64%, Windows 14%! Are you sure? I know more people using the RISC OS than the total Ubuntu, CentOS, SuSE and Red Hat users.